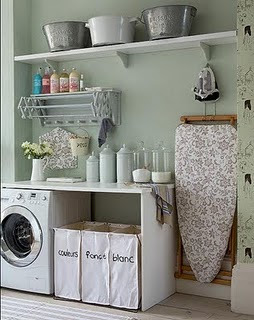 I fell in love with this laundry room photo as soon as I saw it and used it for inspiration for my own. There happened to be an old can of paint in dad's laundry room that was a perfect color. I had a chrome towel rod from our old house that Sean hung to hang clothes that needed to go straight onto hangers. It's such a time saver instead of folding and then hanging! I found the big tin basin in the garage and put some scrap vintage floral print fabric inside. It holds dirty clothes and is so much cuter than a plastic laundry basket. 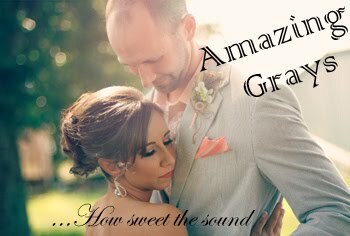 I wanted some inspiration for one of the most dreaded and never-ending chores known to housekeeping...something to remind me that even the most mundane of tasks should be done to the best of my ability. I used scrap wood from the garage and gray paint, then sanded down to the bare wood in places and free-handed the scripture. This garden rack was perfect for everything we need for laundry. Those wavy clear containers are old cocktail bottles I repurposed. They now hold our laundry detergent and vinegar for color loads. The cute hammered silver tin holds our dryer lint and the tin and cream basin holds dryer sheets. My mom painted this cute country scene of a girl hanging out laundry to dry. I want to mount it to a larger piece so I can hang it, but for now it is propped inside our pullout ironing board nook. Joan used the ironing board cover as a pattern and sewed a new cover for it using scrap fabric in a vintage floral. I love it! *~Housewarming Party~* And new house pics!